cheap junk or audiophile bargain? This review is very late. While I remodelled the listening room various items arrived for review and their boxes were stored safely away until the building work was complete. I was just hunting for something else when I came upon the ΨAΘIN MS-12B (aka Yaqin MS-12B) box hidden behind the enormous shipping containers of my old Revox A77 and B77 - anyone who has seen Revox packaging will realise that an apartment block could have been built behind them unobserved! "The old fool's showing signs of dementia already," accuse plebs, stage left, "He's forgetting not only where he puts things, but even that he had them at all in the first place!" Indeed, your old scribe has hung on to the MS-12B for so long that it's European importer has arranged for it to be rebranded with their moniker so that it is now the AAAVT SM-12B. 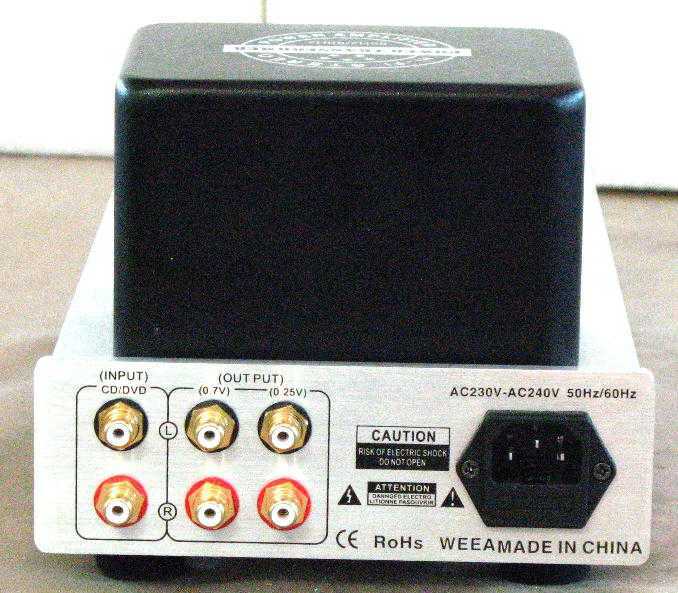 Under its generic title, Yaqin MS-12B, this phono/line pre-amp has earned a good internet reputation, described by one HK reseller as "legendary", so the re-brand is a risky undertaking. What you can be sure of if you buy the AAAVT branded SM-12B is that you are getting the pukka EU specified item, not some grey import clone from the back door of a neighbouring factory. This neatly counters the suggestion elsewhere on the web that the Yaqin MS-12b is 220V not 240V mains compatible, which is odd given that Hong Kong is a true 240V mains supply unlike Europe which is officially 230V with wide enough tolerance to allow 220-240. And, as if to prove a point, the importer gets them with a bit of masking tape on the transformer housing bearing the pencil mark 230V! 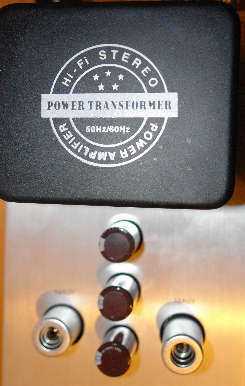 Even stranger is the cheesy printed logo on the transformer housing "Power Amplifier", leading to me at first suspecting I had been mistakenly shipped a hybrid until I noted the lack of speaker wire binding posts. So the AAAVT SM-12B is the genuine article specified by, manufactured for, and distributed in Europe. The AAAVT (Yaqin) SM-12B is a two input, yes two input pre-amplifier! Two inputs theoretically reduces complexity with two benefits, potentially reduced noise and definitely reduced cost. Manufacturers tell me that a major factor in the build cost of pre-amplifiers is the high quality discrete connectors, especially boutique connectors not designed primarily for ease of assembly. The SM-12B features an odd combination of 2 inputs and 2 outputs. The two inputs are a line level and a moving magnet pick-up cartridge input. This is perfect for those REAL STEREO systems with just a turntable and a CD player or hard-drive music server. Who needs more? If you need more you could always add a switching unit (with inevitable loss of quality) or perhaps use the AAAVT SM-12B (Yaqin MS12-B) as an add-on to an integrated amplifier that lacks a phono input. The inputs are relay switched which should reduce switch contact degradation over time compared to standard quality wafer switches and shortens signal paths by placing the signal switch where it is needed in the circuit rather than ergonomic convenience on the front panel. Another line input could usefully replace the superfluous 0.25V output. "Wha-a-at?!? No front or rear panel," shriek plebs, stage left, "The old scribe's not just forgetting things, he can't even see them any more." Look at the pictures: this is one of those rare products that has stepped away from the outdated hegemony of rack system layout, a layout inconvenient to consumers with fancy thick cables and inconvenient to designers who have to put the mains input, the signal output and the signal inputs close to one-another on a single sheet of material. Examining the circuit diagram (which I do not reproduce to protect the manufacturer's design) shows good economical thinking and some useful tricks that won't endear the SM-12B to certain quarters of the hair shirt fraternity. The presence of silicon bridge recitifers in the B+ and the voltage regulated heater power supplies (just like the Concordant Explicit PSU and also resembling - and if my memory serves me - the 1970s Audio Research onboard PSUs) which will tend to firm up the bass and rhythm compared to a thermionic diode (assuming the same size transformer and smoothing capacitors/chokes) but will also tend to harden the sound, often as a consequence of recovery overshoot (causing RF artefacts that may circulate the chassis) unless meticulous earthing (grounding) or soft recovery diodes are used. The final active device in the phono stage is a transistor, which looks to be configured as an emitter follower, not as sand (silicon) acting to load the glass (valves) as is common practice elsewhere. So this phono circuit will have some valve die-hards twitching with fury but I have no religious adherence to any righteous path to audio enlightenment, the sound will be the evidence. The Cathode follower line-stage will invite brickbats from the no feedback sect but will enable the pre-amp to drive long cables or be less sensitive to reactive cable differences. The choice of ECC82 (12AU7) might puzzle some valve-heads as here in the UK it is has been described as 'grey' and 'sterile' sounding, which is odd as it is electrically the cousin of the octal 6SN7 described by some pundits as the most linear pre-amp valve available. Doug Dunlop of Concordant preferred to use the 6CG7 as a b9a type with similar electrical characteristics but finer subjective performance. Once again, my ears will be the principal arbiters of sound quality, along with a few ears borrowed from trusted heads. The AAAVT SM-12B arrived with two sets of valves (yes these are also correctly described as tubes, being tube shaped B9a devices), generic Chinese and Russian Electro Harmonix (reputedly premium Sovtek). I ran signals through both sets for weeks before comparing them. The Chinese no-names were grey and lifeless compared with the Sovteks. I do not know if these Sovteks derive from the Sovtek/EH types designed by J C Morrison; he of Sound Practices notoriety, reputed to subsist on cold coffee and solder fumes in the basement of Fi (NYC store with a religious devotion to anachrophilic tube gear) but they bear his preferred attributes of Dionysian ecstatic, although they also sem to manage Appollonian musical qualities too. The rest of this review is undertaken with the Electro Harmonix valves in place. Testing whether the sound of the valves is better clad in aluminium sleeves (as recommended by the manufacturer) or naked (as has been my experience with other phono pre-amps) proved the manufacturers right. The proverbial veil descended when the aluminium screening sleeves were lifted and the veil lifted when the sleeves were replaced. I have some FullMusic ECC83 in for review from another supplier so I also tried these in the 12AX7 position, but there was some intermittent parasitic oscillation. I assume this to be a problem with their internal capacitance and inductance in the internal wiring and the valve socket wiring as these particular FullMusic samples have non-standard thin gold pins and I suspect poor contact contributed to the problem; the EH and the chinese valves did not have this problem. However, a glance at the circuit diagram for the SM-12B shows a complete absence of grid-stopper resistors, the addition of which should solve the problem. The AAAVT SM-12B worked best standing on Yamomoto PB9 & PB10 points upwards (review coming soon) on the ERaudio SpaceHarmoniser on its own stell cones on the top shelf of the Something Solid EX4. I tried many of the vibration isolation devices in my armory and the SM-12B was quite sensitive to changes. The difference is heard sometimes as a loss of precision to timing and clarity (degrees of fuzziness) or to a sense of the background noisefloor. After several days of listening via both phono and cd input I decided to put the line stage to the test. Determined to identify the character of the line stage and then consider the phono-line combination as a whole I changed cd player from the Avondale AAA5 to the modified Shanling to make use of the variable output showed how much synergy there had been between the bass and rhythm led performance of the Avondale with the SM-12B compared to the Shanling which sounded lightweight in comparison. Being a notorious brutal and unforgiving reviewer I did what no reviewer should do: I compared the AAAVT SM-12B with a condition akin to straight wire with gain (as Peter Walker of Quad used to say). I compared the MS12-B with the direct output of the modified Shanling. I used the Shanling gain control to attenuate it to equal volume directly into my modified Assemblage SET300BSE and this condition will be referred to hereafter as Direct Inject (DI). I used the Shanling at maximum level into the AAAVT SM-12B and matched the level using the latter's volume control. Using my judging system the biggest difference was noted by me on Roni Size Reprazent's Mercury Music Prize winning New Forms where the low-end group of parameters lost the SM-12B 9 marks against DI. The total difference was 13 points on my marksheet, but the total difference noted by my 16 year old son is 9 points in favour of DI. Changing from DI back to SM-12B reduces the difference to 9 points on my scorecard and 4 point on my son's card. This demonstrates the basic stupidity of A-B testing and its tendency to exaggerate differences. Despite this obvious flaw the test was repeated with less processed other musical genres and the general trends noted. Despite this, lower octaves on the line input are transparent and explicit enough to portray effectively the difference between the modified Shanling CDT100c and the visceral thwack of the Avondale AAA5 cdp, especially on material like the Casper remix of TC's 'Where's my money?'. Compared with DI (no pre-amp at all) the biggest differences exhibited by the AAAVT SM-12B are in the bass and soundstage domains. Bass depth & extension, bass speed and bass clarity suffer in percussive bass performances (especially electronic) but less so with orchestral or electric bass miked from the speaker cab. Soundstage shrinks in all 3 dimensions; the AAAVT Yaqin MS12-B linestage doesn't do the illusion of soundstage height and reduces depth to the extent that the soundstage is a shallowarrow flat elipse suspended between the speakers while the DI condition can, with the right recordings, manage a mango shape, twice deeper than height and extending out beyond the speakers. The difference in overall enjoyment between the AAAVT SM-12B is, however, small enough to leave the SM-12B permanently connected in the main system once the comparisons had been made. This is a €390 sitting between a close to €2000 cd player and a €2500plus power amplifier (whose WE300Bs cost more each than the SM-12B) heard through speakers whose passive crossover components alone cost over 60% of an SM-12B. In this context the AAAVT SM-12B's limitations don't look particularly limiting for the money. Ageing readers of this ageing writer will recall my personal favourite phono-pre-amplifier is the Concordant Excelsior, which is far from being the best, or state-of-the-art but I love the way it breaks all the rules by being a valve pre-amp that boogies with the best, PRaT being not far short of the classic Naim point.5 series with a SNAPS although well behind HiCap Pace. High Life on that audiophile classic Jazz at the Pawnshop has always been one of my benchmark rhythm tracks. It demonstrated to me that the Concordant Excelsior was superior to the twice-as-expensive Concordant Exquisite by an order of PRaT magnitude. How will the AAAVT/Yaqin compare? The 'active' RIAA (feedback type filter rather than 2 pole passive) EQ should, according to web pundits, kill the timing compared to no-feedback designs on both the Concordant and the Yaqin. Timing is good enough on the Excelsior, and similar on the SM-12B, while well behind the best high-end modern benchmarks at ten times the price of the SM-12B it is good enough to enjoy cymbal stick noise approximately at the correct end of the overtone envelope. The SM-12B is remarkably familiar in its portrayal of PRaT after the Concordant. Rhythm is not quite as upbeat as the Excelsior, but well portrayed albeit at a slightly reduced pace. Timing is virtually identical. So PRaT is not in modern Naim league, nor indeed up with any modern flat earth favoured RIAA device with a stiff regulated power supply, but is well ahead of many of the competition of sub 1000€ standalone phono amplifiers. In particular, I cannot think of a wall-wart powered phono input that comes remotely close to the SM-12B PRaT. What the AAAVT SM-12B gains over the nearly two-decades old Excelsior is reduced grain. The texture of the signal gets roughened by the old Concordant, probably as the power supply electrolytic capacitors are well beyond their service life. The valve regulated outboard power supply of the Concordant (always its USP) endows it with a high-end sheen, audible over the grain even after all these years. The SM-12B lacks this 'phew' as Doug Dunlop used to call it. Given that (using an online UK inflation calculator) a brand new Concordant Excelsior would now cost £1900 (over 2100€) one could buy over five MS-12B's this is hardly a fair comparison. 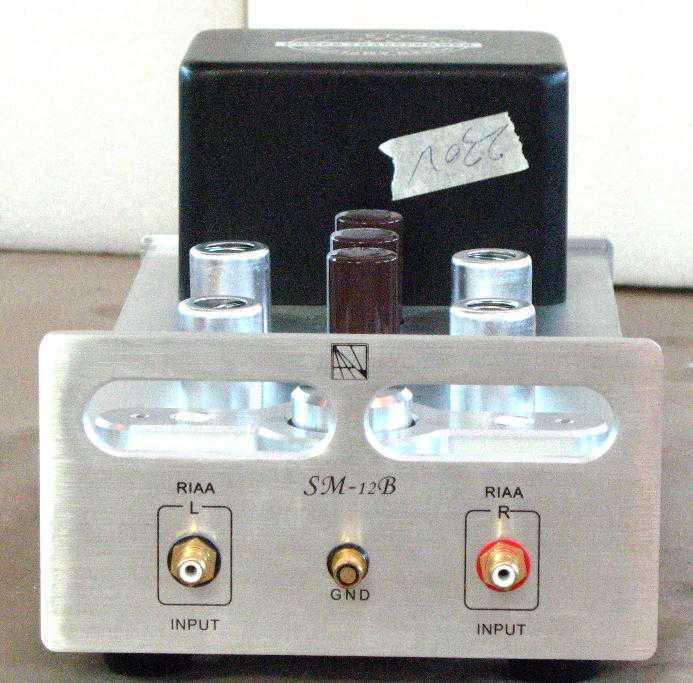 There are a couple of similarly priced (both more expensive actually, but in the sub 600€ bracket) simple valve based active filtered standalone RIAA pre-amps that would be the obvious competitors to the SM-12B. Neither were available to drop into the reference system during this review so I will not name them. From memory of their performance in similar systems I can confidently say that the SM-12B is well ahead of these for PRaT, the foundation stones for music reproduction. The next layer of musical masonry, accuracy and low distortion are also better than the expected par for the price. The leading edge transients are an inevitable casualty of a mains powered 390€ pre-amp as are the subtle nuances of microdynamics. But frankly, at this price point I cannot think of anything that comes close either. Sticking a seriously specified regulated power supply (likely to cost 100€ plus) where the 12v wall-wart used to be on something like the 4-input TEC TC754 does get something slightly more transparent for slightly less money (plus the time you take to modify the regulated psu with extra chokes and bypass caps). I suspect the greater sense of transparency of that combo is down largely to the very accurate RIAA and the fully discrete phono stage, plus the serious vibration damping I applied to the flimsy case. The TEC TC754 (also reviewed on TNT-audio by Geoff Husband) features a fully passive RIAA EQ circuit that elevates its timing performance slightly above the SM-12B. Most of the store bought competitors below 1000€ do not get close to either the modified TEC transparency nor to the SM-12B musicality. Which brings me onto the next group in my judging system. Considering the envelope of individual notes in various bparts of the audio spectrum and their perceived pitch, the low end had the power and tunefulness implied by its decent power supply. The PS is probably equally responsible for the comparatively funky bass presentation, 'comparatively' in terms of many other valve units or solid state units at this kind of price. It is not Naim or Exposure style bass but is on equal terms with older Audio Research (SP8 vintage) that might be bought for a similar price but in need of TLC. Onwards and upwards. The AAAVT SM-12B, predictably enough for a valve driven product, performs very well in the midband. Human voices, while not in the uncanny class of true high-end valve components, are presented with body and realism and instruments in the most sensitive hearing octave and its overtones (basically the treble clef plus a couple of ledger lines). The timbre of acoustic instruments seems accurate and complex passages, while not Naim dissectable, remain coherent and a pleasure to listen to. Soundstage, that elusive quality of scale and space laid out before the listener remains elusive with the SM-12B. This is the SM-12B Achille's heel if it is of any importance to you, dear reader. My Michell Orbe, Hadcock 242SE and MusicMaker II front end can generate enormous virtual images at the end of the room around the speakers. The scale and positioning of the performer's virtual presence collapse to a shallow flat elipse between the speakers when the SM-12B performs pre-amp duties. However, the good power supply does keep everything firmly in its place, especially with minimalist recording techniques, which I find more satisfying than artificial pin-point images or vast hazy exaggerations wandering around like disorientated ghosts. The limiting factors are possibly the active RIAA circuit and the line-amp as the soundstage from CD was diminished although by unpredictable quantities. "Yes, what about that line input?" demand plebs, stage left, "It's what makes the SM-12B different from ordinary phono-stages." Indeed, that line stage is both the AAAVT SM-12B/Yaqin MS12-B's unique selling point and its Achilles' Heel. And NEVER use the 0.25V low output voltage phonos; there is a simple voltage divider that simply shoves an unecessary 56kΩ between the cathode and your unbalanced cables. As an experiment I did try them and indeed they do spotlight cable differences while sounding markedly inferior to the 0.77V sockets. If attenuation is needed it belongs before, not after, the linestage. The line stage, however flawed, represents the difference between the SM-12B and a standalone phonostage with level control. I wonder if the proximity of the power transformer, silicon rectifiers and basic quality heater regulation components contribute to the mediocre performance of the line stage. However, I am judging this by the standards of 1000+€ standalone phono-stages, not 390€ pre-amps because in every other respect the AAAVT SM-12B promises so much. Therein lies the dilemma: as soon as we start tweaking the costs rise suddenly and manufacturing costs then multiply through distribution and retail. Its up to you dear reader to buy one, pull it apart and find the mods that work if you wish to raise the performance level. However, an obvious rival would be the EAR 834P deluxe because both are one-box solutions to the standalone valve phonostage with a volume control. However, while the EAR 834P I auditioned 15 years ago was similarly priced then to the AAAVT SM-12B's price today, inflation and costs have lifted the EAR834P to over 1000€ and it doesn't even have a switchable line stage. I have no idea what current production EAR 834P sound like, by its designer Tim de Paravicini is usually good at consistent production and I have enjoyed several of his designs over the years (my first piece for TNT-audio Box Clever featured an amplifier I built from one of de Paravicini's circuit designs). My recollection of the 834P was that it was way off the pace in terms of... well, pace. I was dissatisfied with the EAR 834P's portrayal of rhythm compared with the valve Concordant Excelsior or the contemporary Naim point 5 series, but I was well impressed with its lush midrange and massive expansive soundstage. So despite superficial similarities in concept (one box, inbuilt substantial power supply, Sovtek ECC83 valves) these two could not have more different strengths. The AAAVT SM-12B's soundstage hangs as though from a washing line strung between the speakers, but this little pre-amplifier manages joie de vivre the 834P of 15 years ago could not approach. Some devices manage width soundstage along the x-axis between the speakers and even beyond; the depth y-axis from behind to before behind the speaker baffle plane; some even manage the height z-axis from floor to above the tweeters (although there should not be enough information in 2 channels). I have heard all these effects with the combinations of equipment I have tried with the SM-12B. Indeed, the Chevin modified Shanling directly feeding the (modified) Assemblage SET300B signature through the (modified again!) Hammer Dynamics bass-mid units paired with the in-for-review B&C DE 400TN-8 tweeters are almost benchmark for 3 dimensional soundstage. So why does the AAAVT SM-12B offer us only a truncated x-axis, virtually no y-axis and the illusory height axis reduced to microns. Ah yes, Pink Floyd's 1977 opus Animals; I recall the difference in '77 when my friend swapped the Shure M75ED in his SME 3009/2imp for a V15 III, especially information retrieval in the track Sheep. The Hadcock 242SE silver/MusicMaker2 riding my Orbe SE drag so much more than I recall from my friends Sondek/SME/V15 and the SM-12B seems to let it through, though it's not a recording with a soundstage! I check and adjust every setting on the Hadcock 242SE silver to make sure the best signal possible is being delivered to the AAAVT SM-12B. While doing this the bias thread gets misplaced off the pulley wheel to lie directly on the outrigger, which renders it no longer parallel to the arm tube and may increase friction. This set up error is immediately audible through the SM-12B, demonstrating its transparency, as the balance shifts, the right channel mistracks and the high frequency timing collapses completely. Only seconds into an LP side I hear the problem, walk over to the turntable and spot the mistake. That much transparency contradicts the woeful sound stage and prompts the final cliche. The final cliche has to be Arné Domnérus' Jazz at The Pawnshop, played to death at every hifi show but probably one of the most explicit soundstage records available. My old vinyl copy has obvious wear in the increased noisefloor but can still throw down the soundstage gauntlet to all comers. I play side 1 and the soundstage is so foreshortenned that Arné is sitting on the drums to play his sax while being struck on the side of his head by the vibraphone mallets. On the other hand, High Life is so joyful and rhythmic that my partner and I leap up and dance. "Over 4000 words so far," quoth plebs, stage left, "and the old fool still hasn't committed himself yet." Musicality is the forte of the AAAVT SM-12B. While it is not the last word in hifi attributes, nor even an early chapter in soundstage stakes, the SM-12B has to be one of the benchmark products in the sub 500€ standalone phono-stage stakes. That the AAAVT SM-12B is also a single line-level input pre-amplifier and capable cable driver is a value doubling bonus. Although the linestage seems to be the performance bottleneck of the SM-12B. For the most part I considered the SM-12B purely in its capacity as a RIAA phono stage because no-one would sensibly buy it as a single input line-level pre-amplifier. The choice of just two sources implies that it is aimed at the real stereo enthusiast whose turntable is their primary source with a cd player, universal player or HD music server secondary for those annoying occasions when a vinyl copy just is not available. As a valve phono pre-amp for 390€ it simply has no competitors. It will look attractive alongside a Garrard 401/SME 3012 or a Gyrodec/RB250 and its sound will not disgrace either. You would have to spend much more money to equal this baby straight out of its box. It would be good if a multiple input version could be made for less than 500€ that would meet a much wider public demand. Finally, the chassis is so good, the AAAVT SM-12B could be your starting point for an evolving upgrade path. Readers would spend many more hours modifying and soldering kits or other products before they could equal the stock SM-12B, and they wouldn't get the superb chassis and tolerable MTX. So experimenters could start with the SM-12B and try different configurations of the line stage to try to open wide the constricting part of the SM-12B. Then try boutique capacitors, custom connectors and audiophile resitors, then really start tube-rolling. AAAVT have sent further 2 alternative stes of valves, which I will report on soon. One retailer describes the Yaqin MS-12B thus, "This is the single chassis version of what is probably the finest pre-amplifier ever made." Clearly this retailer has heard very few high end pre-amplifiers and this is the sort of hyperbole that gets makes the high-end audio world the target of derision. As it stands I suspect the newly renamed AAAVT SM-12B is compromised by its line stage. The RIAA phono section's only audible limitations seem to be those of the line stage, so it may be substantially more transparent, but we cannot tell. The ECC82/12AU7 has a reputation for the kind of limitations I (and everyone else who auditioned) heard from the AAAVT SM-12B and there are electrically similar NOS types that might change this opinion. This brings us to the second bargain rôle for the AAAVT SM-12B. The SM-12B is a bargain mule for the modifiers. A fine aluminium extruded chassis with mostly good fit and finish and a circuit with obvious potential offers boundless possibilities from simple tweaks to total revamps. Watch this space soon for Stage 1 tuning requiring no cutting/shutting or soldering. Judged as a high-end giant killing genuinely audiophile valve pre-amplifier the SM-12B falls at the last fence, the line stage. Judged as the basis for years of happy tweaking the SM-12B scores much more highly. The AAAVT SM-12B judged properly as a sub 400€ pre-amplifier represents excellent value for money. The SM-12B occupies a unique position in the marketplace and deserves attention for that courage alone. Little Feat: Last Record Album, compulsory RIAA test disc, can the vocals separate from the high level bass modulations? the MS12-B has only been outa da system for comparisons. "Over 12 months between delivery and review, the old fool's getting slack," taunt plebs, stage left, "and trying to compensate by writing 4500 words!"